COLOR(S): All colors amongst Hounds; most common are the tricolors of White, black, and light brown. Beagles are always at the top of the list for family-friendly dogs! They are bursting with energy, great with children because of their smaller size, and always willing to play. Extremely good-natured, they have above-average endurance and make great running dogs for casual runners. Bred to hunt hares, these scent hounds have a strong sense of smell that rivals the bloodhound, and will often be used as drug dogs. They also have a unique individual patterning making them easy to identify. 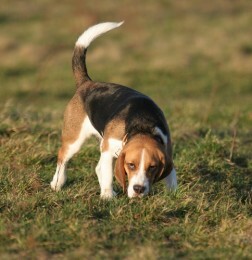 Beagles come in the classic tricolor markings of white/lemon with patches of black and light brown. They can also be found in just two colors of tan and white. Remember Snoopy … yes a Beagle! Fun loving and neither aggressive nor shy, Beagles have a mild disposition making them great companions. In the 1980’s a study was done that gave Beagles the highest excitability rating amongst all dog breeds. Always lively and wagging its tail, small children will instantly love any Beagle puppy that is brought home. Because they are hounds that love to hunt, they follow their nose, which can be a distraction and are bred to move in packs. This can give rise to howling or baying. It is said that Beagles make great companions to cats and they two get along well. Their short hair makes them easy to groom and maintain with minimal shedding. Brushing your puppy once or twice a week with a bristle brush should do the trick. A proper hound glove will make their coat strong and shiny. Because of their long droopy ears, check them periodically for trapped dirt or other things. Beagles love to eat and will gorge themselves on food if allowed. A good daily walk or run should keep this in check as they have bundles of energy and it needs to be released on a daily basis. This should be closely watched as they age and become less active. Common health issues that affect this breed are congenital hear disease, epilepsy, dwarfism, and hypothyroidism. Their expected life span is between 10 – 14 years. It’s strong back and well-rounded ribs give it a large lung capacity with endless endurance. They love to exercise, run, and play outside so daily activity and an active owner is a must. Careful to let them off leash outside of a fenced in area, once they find a scent to track it can be very difficult to get them back at your side. You should begin training your Beagle at an early age, especially if you plan to take them on walks off leash. They love to push ahead with their noses to the ground, so obedience training can be a challenge. Dog training will also be important if they are to be kept indoors. Hounds can be somewhat independent so it is important to understand their character. All in all they make superb family pets!